How to look and feel pregnant when you’re not! I’m pretty sure this guy isn’t pregnant, but bloating can get this bad! A bloated belly and gas are two awful symptoms of IBS that often come together. The pain from trapped gas, the pooched out belly and swollen, full feeling each cause their own kinds of misery. Clothes don’t fit and the gas can cause abdnominal spasms that can make you WISH you could pass out! Well, there can be many causes of bloating (stomach flu, menstruation, etc.). Since this is an IBS website we’re going to be talking (or reading) about the abdominal bloating that’s part of IBS. That’s when your belly swells up and makes you feel miserable for no apparent reason :(. If you have the gas that often causes or accompanies abdominal bloating then you can have terrible belly pain. Another reason people become bloated is due to an inflamed colon. Blood fills up the tissue of the intestinal tract causing it to swell, often causing abdominal pain and discomfort. And I’m not kidding when I say it can make you bloated enough to look pregnant. 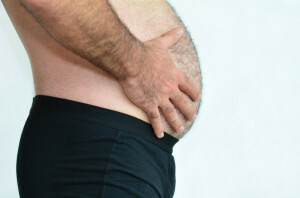 A bloated belly can make you feel like your belly is going to pop your clothes. In the case of IBS, a bloated belly may be caused by food sensitivities that irritate your intestines, or foods that cause you to have excess gas. In either case finding out which foods cause your bloating are your first priorities! A food elimination diet or a food sensitivity test can go a long way to help that. If your body is sensitive to certain foods, it’s sure to cause and inflamed colon at some point. Lactose intolerance, a sensitivity to milk products is one of the most common causes of belly bloating, but there are many others. How can I prevent this kind of bloating? Well, assuming you’ve been to your doctor, and ruled out other problems like inflammatory bowel disease, etc., I think you should try cutting back on foods that give you gas (Beans, dairy and broccoli for me; heck, beans for just about everyone!). You could also try the food elimination diet link above to see if there are foods that you are sensitive to. Also, I’d check out the food sensitivity section of this site. As always make sure you’ve checked with your doctor to make sure there’s nothing serious going on! Hi. I haven’t been diagnosed with IBS, but when I wake up my belly is very thin. After each meal I eat it blows up. By the end of the day I look 4 months pregnant, this bloating COMPLETELY subsides when I go to sleep every night. Is this a classic IBS symptom? I’m goin to the doctors soon but for peach of mind before then I would like to rule out other possibilities. I also have spasms under my left and right rib up to my underarm. I have frequent gas too. Bloating, and gas, etc., are OFTEN associated with IBS. I would guess that is where your doctor will head. Hopefully it will be something easier to fix, like SIBO or something like yeast. GOOD LUCK! 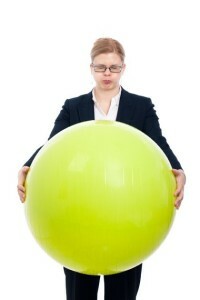 What I think is that something is irritating her bowels, or something is out of balance. I wouldn’t be surprised if the beer played a role, but there could be other things. The trouble is finding out what. If she’s already had all the tests, and if the doctor can’t find anything then, in my thinking, the next step is to try and find out if there are foods or drinks, or medications she’s taking that could be causing the problem. The best way to do that is to find out more about “food intolerance” and a “food elimination diet” If you use the search, I have info here at the site about it. Shawn, this is the best site about our conditions. Everything you write is so very helpful for the average person. I have suffered for so many years. I am having an ensocpy (spelling) on January 10 to see if that is causing some of my IBS. Small intestine problem can make a lot of this happen. So I think, not a dr. Sugar is my big problem. addictive I am and I am having a bad time this last week. Love the heating pad, my best friend. my boyfriend has bloating and diarreha almost everyday now after eating sometimrs at night he has a drink before bed and latley he get sick and diarreha right away . Hi Sherri, There are a lot of things that can lead to this sort of problem. If your boyfriend is sensitive to a food, like gluten/wheat or dairy, then that could certainly be an issues. You two may want to look at the Is a Food Intolerance Causing Your IBS? page. Also A lot of people are sensitive to alcohol, see the Alcohol and Diarrhea page. As always, if something like chronic diarrhea persists, he should DEFINITELY see a medical professional. There could be a simple fix, or he might find out there’s a problem. Best to catch problems EARLY! Your website has been a big help to me in answering so many questions that my doctor had no answers for. because of the bloating. Probiotics have helped. I just went gluten free and it looks like I might have to go dairy free too. Thanks for your informative website, it really helped me a lot. That really does help. I eat far too much sugar and by the end of the day I always look 3 months pregnant. So, I’m going to try cutting out sugar… coffee and milk for a while and see if it improves.